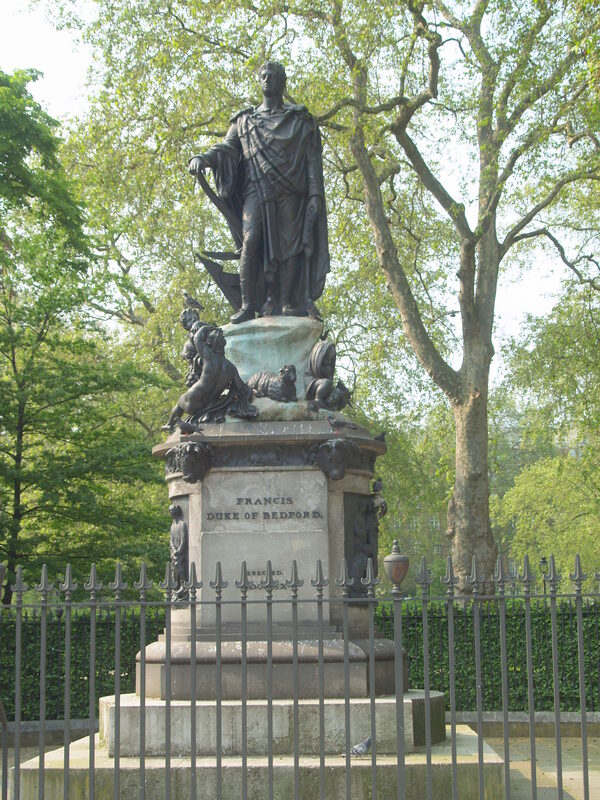 It’s notable that of all the statues scattered around the Bloomsbury squares, only three are of politicians, Charles James Fox in Bloomsbury Square, Fenner Brockway in Red Lion Square, and Mahatma Gandhi in Tavistock Square, but the last two at least have greater claims to fame. All but one of the people celebrated have local connections. because the Bedford family, who owned Bloomsbury, were supporters of the same party. 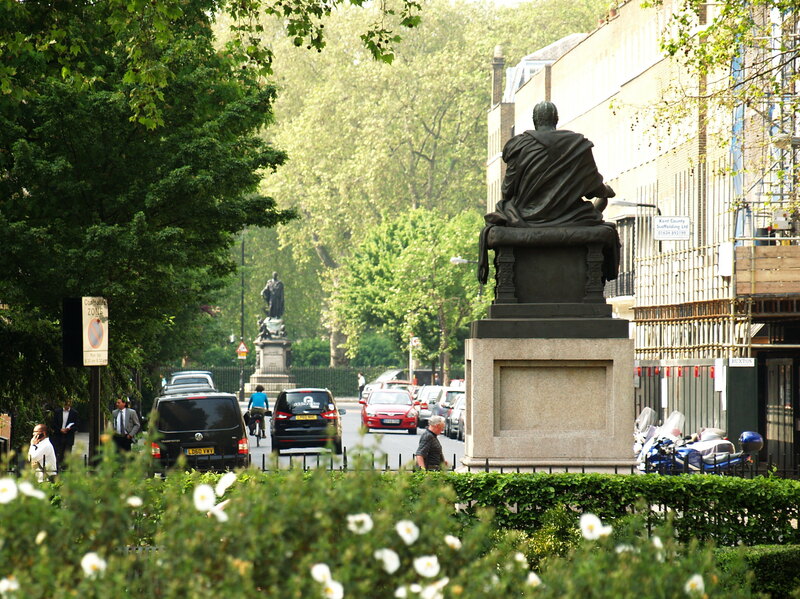 Now, Fox’s statue and the contemporary statue of the Fifth Duke of Bedford, the only statue in Russell Square, face each other along Bedford Place, the street which runs between the two squares. 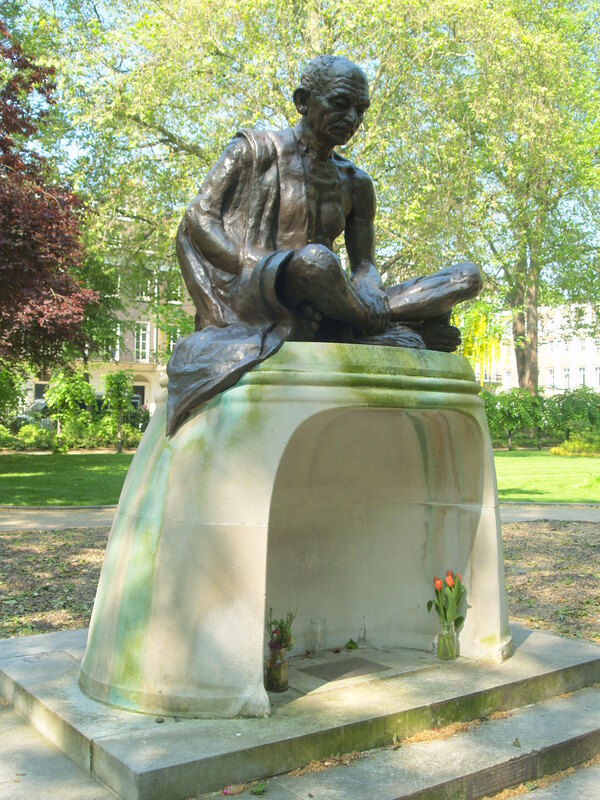 Gandhi, of course, has a local connection, having studied at London University for some three years before being called to the Bar. 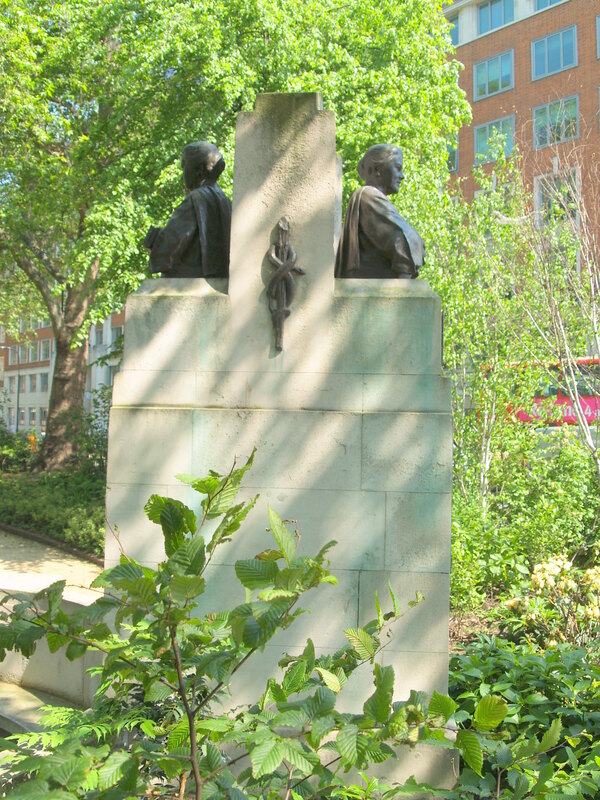 and Dame Louisa Brandreth Aldrich-Blake (1865–1925), a pioneering woman physician and surgeon in nearby hospitals (and the British Medical Association is in Tavistock Square), whose bust looks both into and out of the square. Also in the square is the large stone memorial to conscientious objectors. 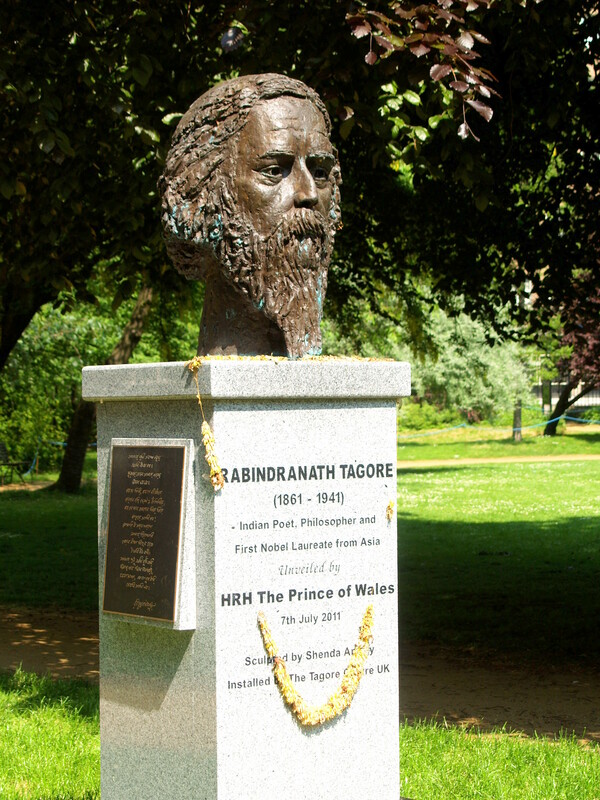 Gordon Square has a sculpture of Rabindranath Tagore (1861-1941), who was the first non-European to win the Nobel Prize for Literature in 1913. He was born in Calcutta, but briefly studied law at University College London. 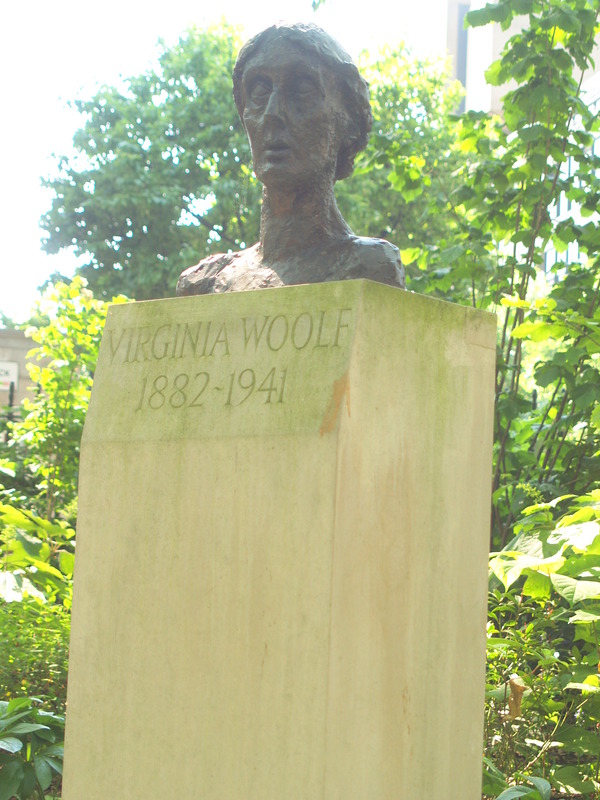 The most recent of all the sculptures is also in Gordon Square. The bust of Noor Inayat Khan by Karen Newman, is believed to be the first of an Asian woman in Britain. Princess Anne unveiled the bust on 8 November 2012. Noor Inayat Khan was born in Moscow, lived as a child in London and France, and in 1942 was living again with her family in Taviton Street, just off Gordon Square. She was in training as a Special Operations Executive secret agent, known as Nora Baker, before being sent in 1943 into Nazi-occupied France as a radio operator. In France she was betrayed and finally was shot in September 1944 with three other female agents at Dachau. She was posthumously awarded the George Cross. In a secluded corner of Gordon Square is a sarsen stone, erected outside the UCL Institute of Archaeology in 2012 to commemorate its 75th anniversary. An object of interest nearby is the globe in Torrington Square just outside Birkbeck , commemorating 150 years of the University of London External System in 2008. 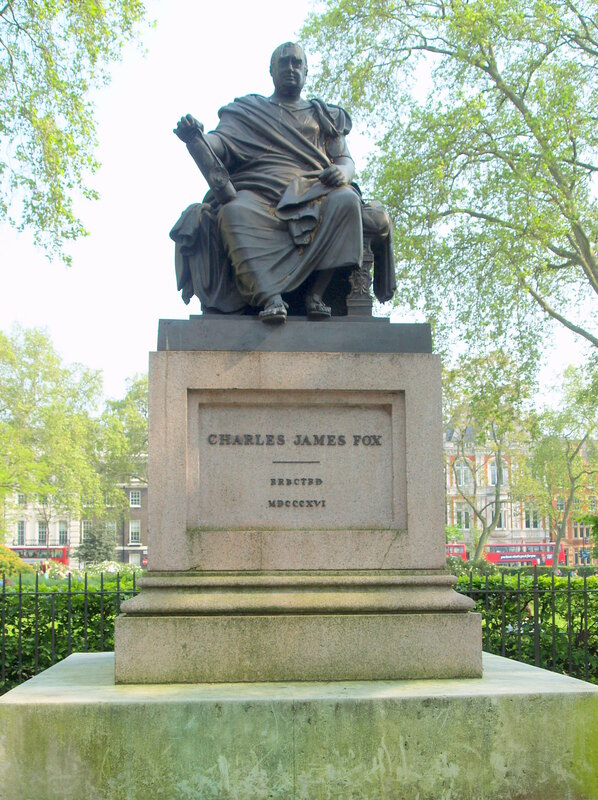 John Cartwright (1740-1824), known as the ‘Father of Reform’, is commemorated in Cartwright Gardens by a bronze statue by George Clarke (erected 1831). His main concerns were legal equality, universal suffrage and secret ballots. The name of the crescent-shaped square, which now bears his name, was changed was to offset the notoriety created by two brutal unsolved murders in 1878 and 1883. 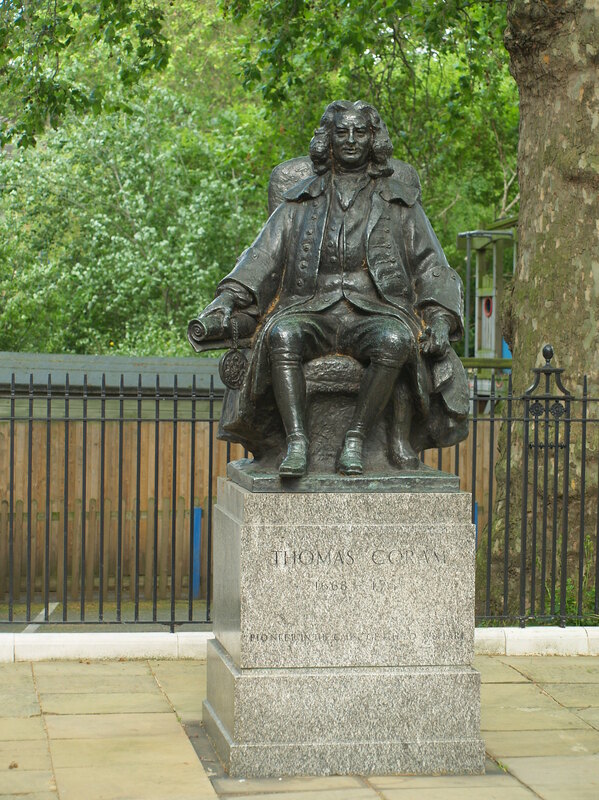 Brunswick Square has managed over all its over 200 years to remain a statue-less garden, but just outside is the statue of Thomas Coram, the instigator of the world’s first children’s charity, The Foundling Hospital, which stood behind him. 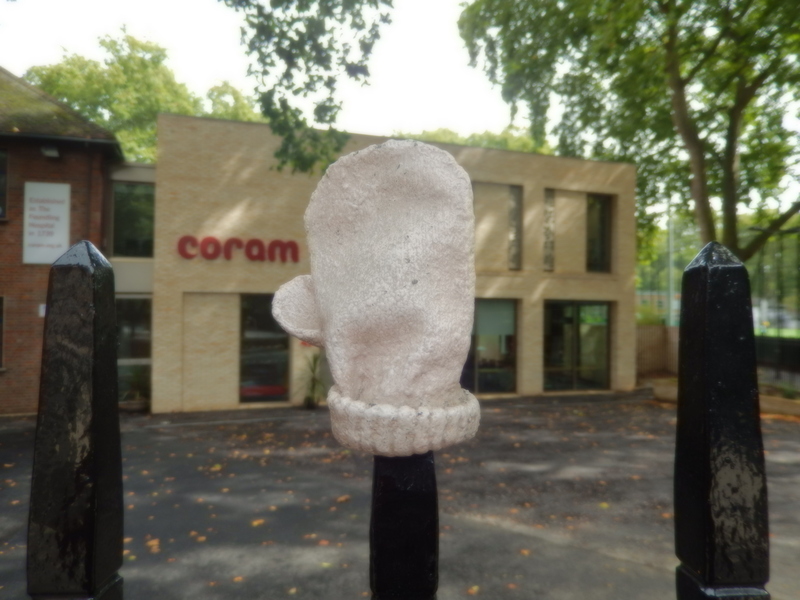 Nearby, on the railings, is a small lost mitten by the artist Tracy Emin, reflecting childhood and loss, and recalling all the tiny tokens left by unhappy mothers entrusting the children they could not care for to the former Foundling Hospital, but hoping they would recognise their child by the token if they were able to reclaim them in the future. 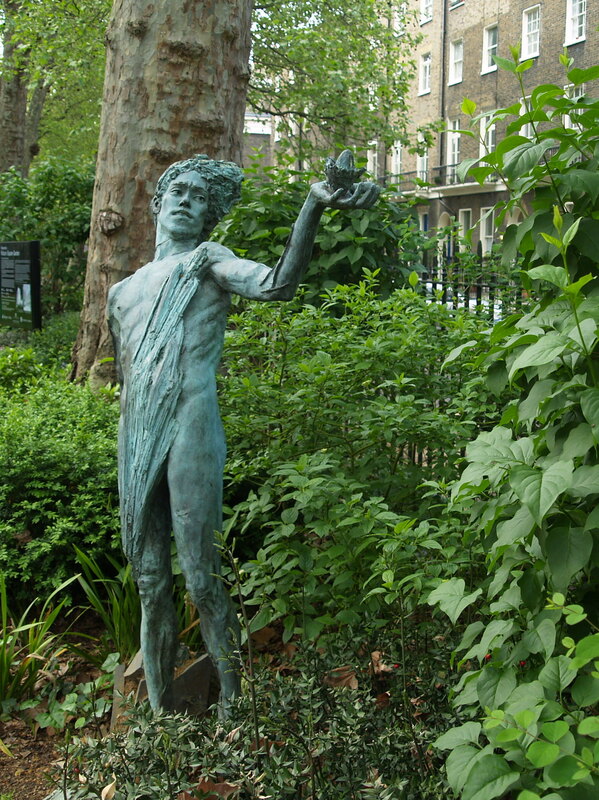 Another hard to spot memorial is actually inside the gardens, set flat in the grass behind the crescent hedge: by Serena Korda, it commemorates the great Victorian dust heaps of Gray’s Inn Rd. One of the industries to be born out of the heaps was London brick making: ash, cinders and rubbish from the heaps were mixed with the mud of nearby brick fields to produce the humble brick. Other sculptures of interest in Queen Square are a bust of another philanthropist Lord Wolfson; a cat (Sam) ‘donated by the local community in affectionate memory of Patricia Penn (Penny) 1914-92, Champion of local causes and cat lover’; and a mother and child (2001, by Patricia Finch), purchased by the Friends of the Children of Great Ormond Street Hospital (just off the square) in memory of Andrew Meller. In Bloomsbury Square there is an engraved plaque in the central paving that shows the first Bloomsbury square as it would have looked in John Evelyn’s time, when it was called Southampton Square, with a quotation from his diary in 1665: Dined at my Lord Treasurers the Earle of Southampton in Blomesbury, where he was building a noble square or piazza, a little towne. In Red Lion Square, the northernmost of the local squares, is a bust of Bertrand Russell, the philosopher, Nobel Laureate and Bloomsbury Group member (His grandfather, Lord John Russell, was the youngest son of the 6th Duke of Bedford). There is also a statue (erected by the Greater London Council in 1985) of Fenner Brockway, peace activist, co-founder of War on Want and MP at various times. Brockway was a prominent member of the British Humanist Association and South Place Ethical Society where he became an Appointed Lecturer during the 1960s. The Brockway Room at Conway Hall in Red Lion Square is named after him. 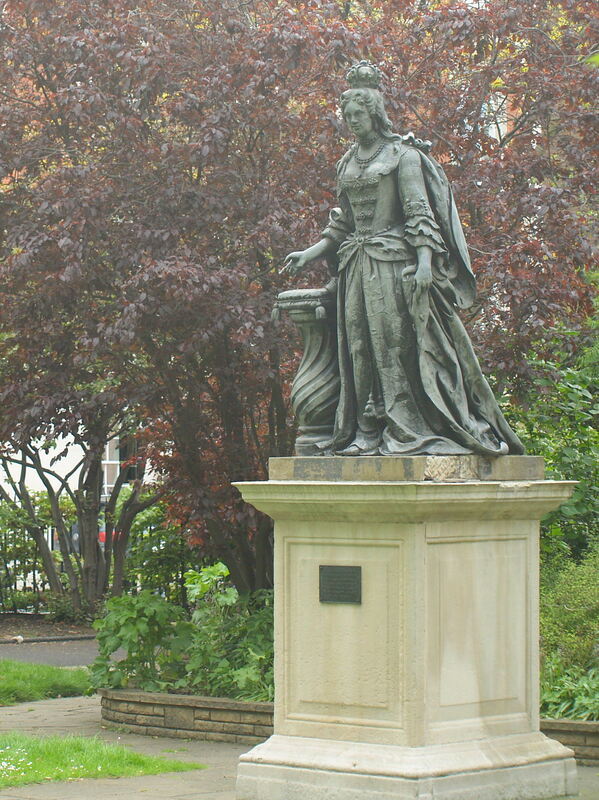 A bronze statue of Pocahontas by David McFall (1956) was commissioned by Cassell’s the publishers for their new premises at 35 Red Lion Square, London in the 1950s but was later moved elsewhere.